Stainless steel hand wash basins with an easy-clean, naturally antibacterial surface and an attractive, high polished finish, are the perfect choice for any environment, from highly-specified laboratories to schools, colleges, care homes, restaurants, bars and domestic settings. Whilst our range features a large selection of standard, pre-fabricated stainless steel basins in food-grade steel, our bespoke production base means you have the option to specify the exact size, shape and style of basin you require for your project. All our standard stainless steel hand wash basins come supplied with an integral removable skirt to hide the waste fitting out of view, integral wall fixing holes, and a full waste and overflow kit. In addition, we can supply tap hole stoppers where only a single tap hole is required. 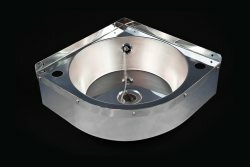 Our bespoke wash hand basins are fabricated from a choice of 304, food-grade steel, which is super-strong and impact-resistant and complies with all current Health & Safety and Food Hygiene regulations; and 316-grade stainless where a laboratory hand wash basin might be required; which offer the ultimate corrosion resistance needed for specialist laboratory work. prefabricated wall-mountable basins: perfect for areas where there is no bench top or where work-surface space is at a premium. fully bespoke basins: of a higher quality than our prefabricated basins and offering greater flexibility, these premium hand-wash basins can be tailored to your exact specifications – meaning you can determine the external and internal size and shape of the unit, to fit any space and to complement any room design. For ideas of how you can integrate a hand-wash basin into your room plan, take a look at our full range of products. We also offer wash troughs and vanity tops – both ideal for areas of heavy use, such as school, college, healthcare or public washrooms – plus shower trays and trough urinals. With a choice of either standard (prefabricated), 304 food-grade stainless-steel basins or premium bespoke basins in either 304-grade or laboratory-grade (316) steel, there is bound to be a hand-wash basin to fit your laboratory project. Both types of steel offer integral strength, antibacterial properties, plus resistance to impact and extremes of heat. For areas where corrosive acids or extremes of heat will be prevalent, order one of our bespoke basins in 316-grade steel, which offers astonishing durability and will withstand the demands of a high-stress laboratory environment. Whilst epoxy resin is sometimes used in laboratory basins, we have found it to be less heat-resistant than stainless steel. Resin also scratches and cracks more easily, has lower resistance to bacteria and, because of the need to apply glue in the assembly process, cannot match the seamlessness of welded steel. This is dangerous because it can leave joins in which bacteria can gather. corner basins, for tight spaces or to fit an awkwardly-shaped room. All of our standard basins are supplied as a complete kit, for ease of fitting. Please refer to our chart for specifications. 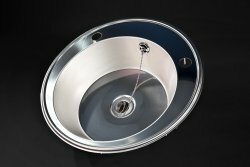 Our premium-quality, bespoke basins are supplied with a waste fitting and, in most cases, integral brackets. Our laboratory range extends far beyond basins: take a look at some of our other items, from stainless-steel worktops to fume cupboard liners, extractor fans, sinks, cupboards, shelving, splashbacks and shower trays. We can even fabricate a worktop with an integral, fully-recessed bowl, keeping splashback to a minimum – ideal where hazardous chemicals are deployed. Whatever your laboratory-outfitting needs, we can help: get in touch today, to discuss your requirements. In areas such as clinics, surgeries and care homes, hygiene and durability are paramount. Regular hand-washing needs to be carried out in a basin that is robust, impact-resistant and easy to clean. Our standard range of stainless-steel hand-wash basins is made from pressed, 304 food-grade steel, which conforms to all current Health & Safety and Food Hygiene regulations. The steel’s inbuilt antibacterial properties mean the few germs that do adhere are easily wiped from its surface. Our prefabricated basins come in a variety of sizes and shapes, and in a choice of inset – for easy fixing into a cut-out in a worktop of any material – wall-mounted and corner units. For a more tailored wash-basin solution, such as in a tight space where an exact size and shape are required, our bespoke fabrication service offers an almost limitless choice. Fabricated from premium, 304, food-grade stainless steel (or 316, laboratory-grade steel for areas where corrosive chemicals are employed), these items can be specified to exact measurements – both internally and externally – as well as to a precise shape and style, from inset – designed for easy fitting into a cut-out in any worktop – to wall-mounted and corner basins. We can also supply fully-recessed bowls, which are set low into the worktop, to avoid splashback. Our bespoke washbasins are so strong and durable, they will greatly outlast epoxy resin – making them the truly cost-effective choice for your healthcare project. Every academic setting has its own requirements, be it a university laboratory, a school or college food technology room, a washroom or a catering kitchen. We offer a range of affordable, prefabricated, stainless-steel hand-wash basins in a choice of round, rectangular or ‘corner’ shapes, and in a variety of sizes. Where there is no work surface – or workspace is at a premium – you can opt for a wall-mounted unit. We also offer inset basins, for easy fitting into a cut-out in any worktop. For the highest level of hygiene, choose one of our bespoke stainless-steel worktops, where the welded joins will be virtually seamless, keeping bacterial build-up to a minimum. Please consult our specifications chart, to see what sizes and styles are available. If your wash-basin requirements are more specific, we offer a bespoke service. 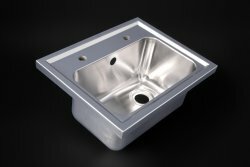 Utilising either our 304 food-grade steel or laboratory-specification 316-grade, these premium basins can be fabricated to the exact size and shape you require. Strong and impact-resistant, they are so robust that they will stand up to the heavy-use requirements of academic institutions, and will last for decades. We also provide wash troughs – ideal for a nursery or school setting – plus urinals and shower trays. Check out our full range of products, or contact us today, to discuss your specific requirements. With the demanding hygiene requirements of a catering kitchen, you need a hand-wash basin that will stand up to heavy usage on a daily basis. Choose from our range of prefabricated, stainless-steel basins, which can be supplied in a choice of round, rectangular or ‘corner’ shapes, and in a number of different sizes. There is also the option of wall-mounting units or inset basins. 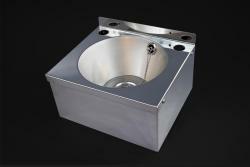 All of our prefabricated basins are supplied as kits, complete with fittings and waste units*. Please refer to our chart for full specifications. Alternatively, where your requirements are more specific, opt for a bespoke hand-wash basin, fabricated to your precise specifications by our skilled engineers. These premium basins are so robust and durable, they will last for decades. They are also the ideal choice for awkwardly-shaped rooms or space limitations. With an easy-to-maintain, naturally antibacterial surface and a hard-wearing finish, our stainless-steel hand-wash basins are the ultimate in hygiene and durability. Whether you need a high-shine, contemporary finish for a corporate washroom, or a durable, impact-resistant unit for a school, college or nursery, stainless steel is the optimal choice. Made from 304, food-grade steel, our standard range of prefabricated basins is available in a variety of sizes, and in a choice of wall-mounted, inset (round or rectangular) or corner-style units. Our standard basins are supplied as a kit, comprising everything you need for an easy installation*. Please refer to our specifications chart for full information on our prefabricated basins. If you have very specific requirements, we also offer a fully bespoke service, in which we will meet your exact specifications for size (both internal bowl and external), shape and style of basin. 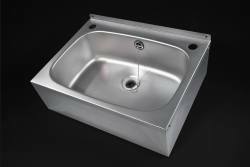 These premium basins are made from superior-quality steel and will last for decades. They come complete with the waste unit and, in most cases, integral brackets. 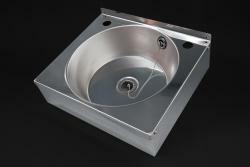 For the ultimate in hygiene control, we can fabricate a stainless-steel worktop, with the basin as an integral feature. The seamless, welded finish means there are no dirt traps in which bacteria can breed. We also offer a range of vanity tops, plus shower trays, splashbacks and plinths. Get in touch today, to find out how we can fabricate the product you need to furnish your washroom. Sleek, gleaming and fabulously contemporary: a stainless-steel hand-wash basin is the perfect choice for your bathroom or wet room. Whether you are putting together an entirely metallic bathroom scheme for a futuristic effect, or are seeking to create a calming oasis of smooth, reflective surfaces, a stainless steel basin will complement your scheme perfectly. Whilst ceramic basins can chip or stain over time and resin tends to discolour, your steel basin will retain its shine over the years, with only the minimum of wipe-clean care. We offer an affordable range of prefabricated basins, in a choice of shapes – circular, rectangular or ‘corner’ – and with the option of wall-mounted (perfect where surface space is at a premium) or inset basins. The latter can simply be inserted into a cut-out in a worktop. For a fully-integrated design, we recommend our stainless-steel worktops, into which we will weld your hand-wash basin, providing a seamless finish. This means there are no joins in which germs can breed. What’s more, stainless steel is naturally antibacterial, making it the most hygienic choice for your bathroom or wet room. Please consult our chart for full specifications of our prefabricated hand-wash basins. For a wash basin that’s like no other, take advantage of our bespoke service. Our skilled engineers will fabricate the exact shape and size of basin you require, to fit both your available space and interior design. Created from the highest-quality steel, these premium items are so durable, they come with a 25-year warranty on materials and workmanship**. Stainless steel is also the environmentally-responsible choice: the raw steel sheet comprises around 60% recycled materials, and the finished unit is fully recyclable. With the stringent hygiene requirements of a veterinary practice, it’s essential to choose a hand-wash basin in stainless steel, for its naturally antibacterial surface. 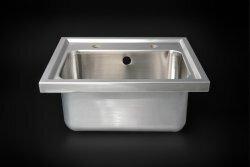 Our standard range of basins are made from pressed, food-grade steel, which will stand up to the near-constant daily usage of your veterinary practice. These easy-to-clean basins are available in a wide choice of shape and size. Corner units: ideal where space is limited. We also offer wall-mountable basins, which keep work surfaces clear for medication and instruments. In cases where your veterinary surgery has very specific needs, take advantage of our bespoke service. This tailored approach allows you to specify the exact size (of both the bowl and the exterior), shape and style (including wall-mountable and inset) of your basin. These made-to-order hand-wash basins are fabricated from a premium-quality, impact-resistant steel, which will last for decades. Supplied with a waste unit and, in most cases, integral brackets, they are easy to install. For the highest level of hygiene, we recommend our stainless-steel worktops, into which we can weld your hand-wash basin. This seamless finish means there are no obvious joins in which bacteria can gather. Our workshop flexibility allows placement of the basin at any point in your work surface. We also offer a range of products, designed for easy installation and fantastic durability. These include worktops, sinks, splashbacks, shower trays, cupboards and shelving – and any bespoke stainless-steel item you might need for your veterinary clinic. *Please note that taps are not included. **Please refer to the Resource section of our Help and FAQ page for full Warranty Terms & Conditions.